CK Chow struck a cautious note at the start of the week when revealing the Hong Kong Exchange’s annual results. With average daily turnover down 37 per cent, the exchange chairman’s wariness was understandable as he talked of a “challenging” outlook and volatile markets. Yet such caution is out of step with the mood. 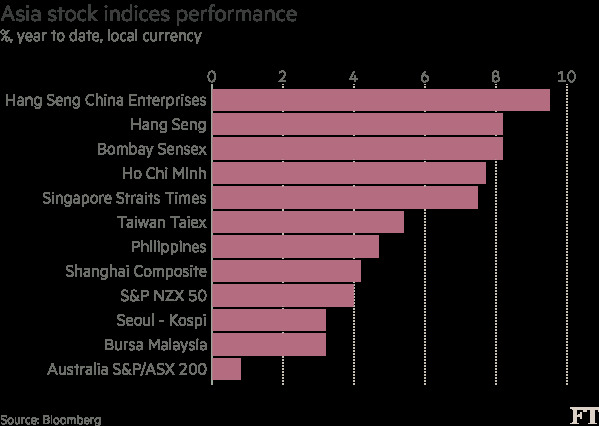 Hong Kong’s blue-chip Hang Seng and China-focused Hang Seng China Enterprises indices are among Asia’s best performers in 2017. Their rallies mark the first positive start to a year for either benchmark since 2012. The Hang Seng has risen 7.9 per cent, while the HSCEI has climbed 9.5 per cent. Trading volumes in the past month are running a fifth above last year’s average, and block trades — a sign of institutional investor appetite — have picked up sharply. But this buoyant start has so far failed to deliver the Hang Seng a decisive break above the 24,000 mark, which has, more or less, acted as a ceiling for the past seven years. The index closed 0.8 per cent lower yesterday at 23,740. The key, say strategists, is how sentiment evolves towards China. More than three-quarters of the Hang Seng’s market capitalisation is made up companies from the mainland. That sharpens the focus on the HSCEI, which consists only of the Hong Kong listings of mainland-based companies. “Investors tend to only focus on China when they perceive trouble, but we believe now is a good time to consider the opportunities,” says Helen Zhu, head of China equities at BlackRock. In terms of earnings, the HSCEI has long appeared to be a bargain, trading on just eight times forecast profits. Although that is up from six times a year ago, it compares with 13 for Shanghai and 23 for the tech-heavy Shenzhen. 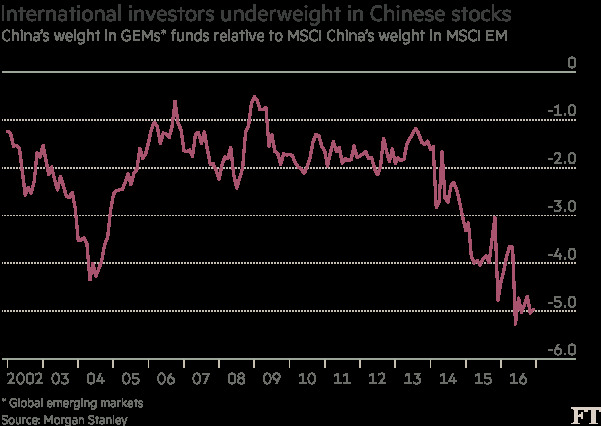 Investor surveys suggest international fund managers hold the lowest positions in Chinese stocks in a decade, relative to benchmark indices. Yet traders and bankers say international buyers have not been driving the rally, leaving open the possibility they could provide fresh impetus if those underweight investors choose to buy later. “In our view, China’s improving fundamentals underpin the recent gains in the equity market,” says John Woods, Asia Pacific chief investment officer for Credit Suisse Private Bank. He predicts the HSCEI can gain another 11 per cent over the next few months. So far the evidence points to mainland investors driving the Hong Kong rally. Net inflows via the Stock Connect trading schemes that link Shenzhen and Shanghai with Hong Kong have reached almost $7bn in 2017 — almost 50 per cent higher than last year. “The key catalyst for the rally is the marked acceleration in southbound Connect flows,” explains Jonathan Garner, chief Asia and emerging markets equity strategist for Morgan Stanley. The bank has a year-end target of 26,000 for the Hang Seng. Bankers say the flows are being led by an increase in interest from insurers and mutual funds. As a result, a persistent premium for the domestic A share market over H shares — the Hong Kong shares of mainland groups — is hovering near its lowest in two years. It has fallen to 19 per cent from 37 per cent a year ago. The efforts of policymakers in Beijing to cool China’s property market are also encouraging investors to turn to stocks: the Shanghai Composite index finished February with its best performance, up 2.6 per cent, since November. The renminbi is playing a role, too. Its fall last year — the offshore rate dropped 5.8 per cent against the dollar — encouraged the mainland move into dollar-pegged Hong Kong as a hedge. This year its gains have been viewed offshore, along with a series of surprisingly positive data on trade and manufacturing, as a sign of China’s stabilising economy. Yet analysts warn that Hong Kong’s rally could yet come undone. They cite the risk of US protectionism to export-heavy China, as well as the rising danger the Federal Reserve could tighten policy more than expected. China’s monetary policy has also been tightening.